There is nothing so annoying not being able to access the Internet… you can’t even get online to check for help. In this article we’re going to cover several ways you can fix your internet problems including completely resetting your Windows 10 network settings. 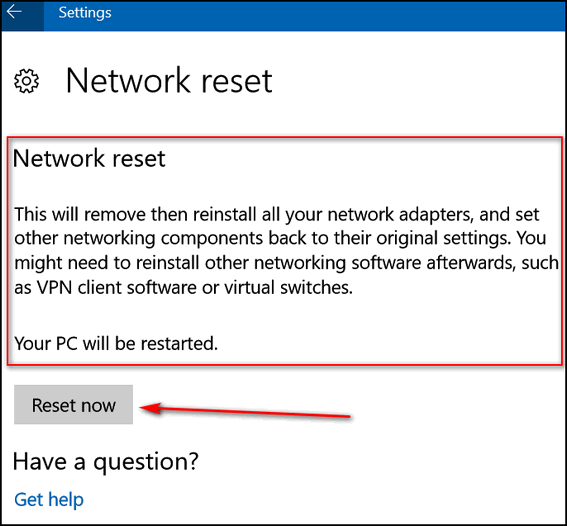 Remember though, resetting your Windows 10 network settings should be the last thing you try – and only after you’ve tried everything else we cover here. 1. Make sure it’s your computer’s problem. If you have another device in the house like a tablet or smartphone and it cannot connect either – it’s not your PC – it’s your internet provider or your equipment. If your Internet connection is not working at all for any device, call your ISP. If it’s just your computer that cannot connect then move on to step #2. 2. Power cycle your modem/router. See our article about power cycling here. If this does not help, move on to step #3. If you still cannot connect then try completely resetting all Windows network settings. This will remove and reinstall all your network adapters and reset all networking components back to their default settings. If you’re using a Wi-Fi connection, after you do this reset you’ll need to type in your Wi-Fi password. So make sure you know what it is before you start. See our article here to learn how to find your Wi-Fi network password. 2. In Settings click on Network & Internet. Under Status, near the bottom, click Reset network. 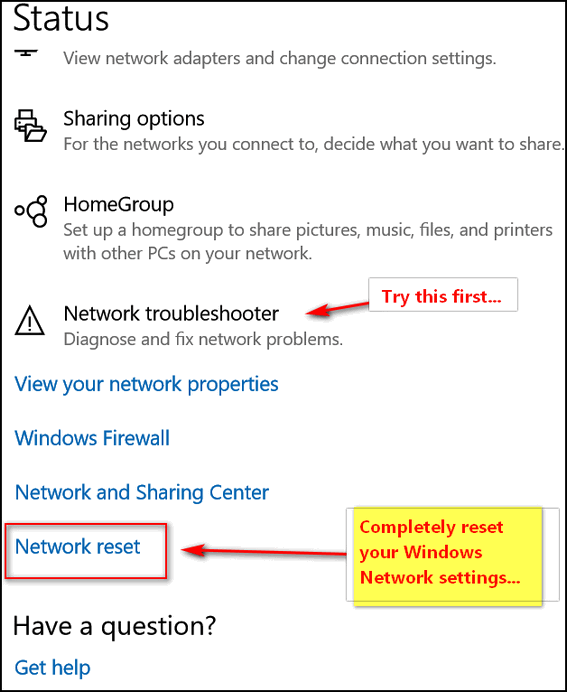 If you want to proceed with completely resetting Windows 10 Network settings, click on the “Reset now” button. Windows will remove all network adapter reinstall them and return all your network settings back to their original values. REMINDER: Make sure you know what your Wi-Fi network password is before you begin. You need it to log in to your Wi-Fi network. Do a Network reset does not change your Wi-Fi password. You Wi-Fi password can only be changed in your router’s settings. Hi, I learned that Homegroup is discontinued in Windows 10. I used it to connect my 2 computers in home. Now I’m not able any more to synchronize and have updated my files in both computers. Any idea how I can do that, without using a cloud service? Thank you! Open Settings > Shared Experiences and turn on Nearby Sharing and select “My devices only”.